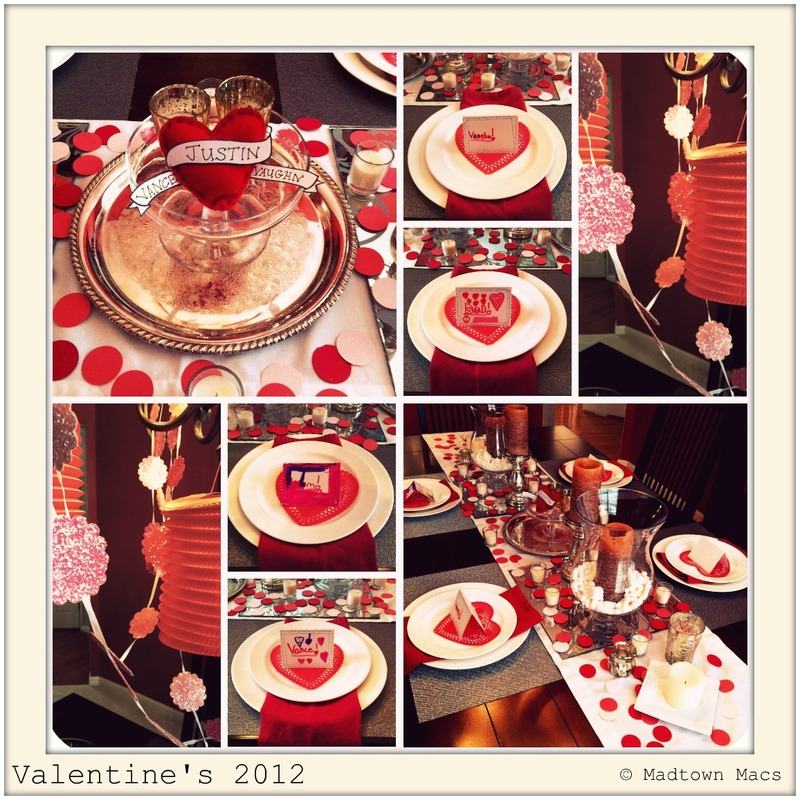 Some say Valentine's Day, some say Estate and Trust Planning Day. You know, it's a tomato, tomahto type of thing. My husband, being the romantic that he is, scheduled a meeting for us with a lawyer to do our will today. What says romance more than the piece of mind that comes with providing security for our two goofballs? Believe me. I'm as tired as you are of seeing these things. 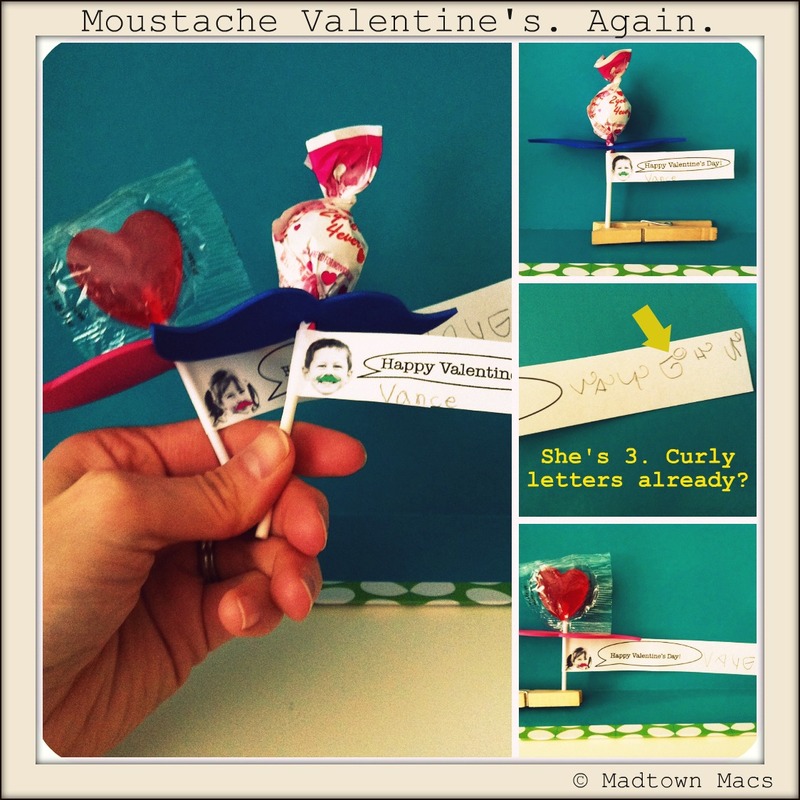 Hopefully this will be the last time you'll see Valentine Moustache Pops here. Ever. The kids are excited to hand them out today and for their class parties. Here's what's going on in the dining room right now. Yes, it's over the top but it's hard corralling the kids when it comes to decorating. Still don't know what's on the menu for tonight. I'm thinking noodles of some sort. We'll see! No plans for dessert yet either. you got a lot going on at that table! Charisa, you are amazing! I love the table. Maybe if I decorated the kids would actually sit down and eat. We are ordering heart shaped pizza tonight. 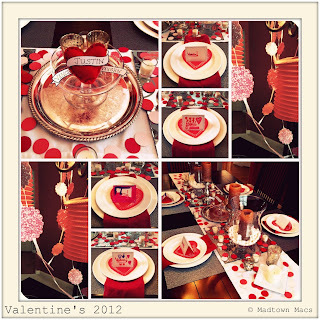 Have a wonderful Valentine's Day dinner. Thanks guys! We had fun doing it! Aunt Dee, no festive drinks. Boring, I know. Sarah, we did heart shaped pizza last year. It's fun! (I would have done it this year too, but Survivor starts tomorrow which means it's Pizza Night tomorrow for us.) Looks like noodles for us and over-priced cupcakes for dessert! We were going to go out and then went home to let the kitties out, sat on the couch and it felt soooo good - and warm, we looked at each other and said, we're stayin' in.